I love this book. 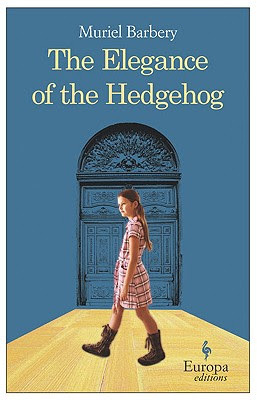 The Elegance of the Hedgehog by Muriel Barbery (translated by Alison Anderson) is beautifully written, the story is compelling, and I really am totally head-over-heels in love with it. It’s pretentious in just the way I like: elaborate vocabulary, beautifully constructed sentences, and obscure literary references one has to know Russian classics to understand. I will admit, The Elegance of the Hedgehog wasn’t love at first page. The NYT review agrees: “Especially in the novel’s early stretch, Barbery, a professor of philosophy, seems too clever for her own good.” But by about 50 pages in I was hooked, and 150 pages in I was 100% sold. The story is written in a series of short chapters, alternating between Renée and Palmoma. Some have more action, and some are more like essays. The story really picks up when Mr. Ozu, a Japanese businessman, moves into the building. The three become unlikely friends and it is wonderful. Have you read this book? Did you love it? The language in this book is so good - there are certain passages I read over and over just because I wanted to savor the sounds and ideas. I could copy and paste quotes to you for ever...but I won't. Just read it! Here's a good review/summary. and an interview with the author.